Shield bugs, also commonly referred to as stink bugs, are plant-feeding insects found as far north as Quebec, Canada and as far south as Texas. Shield bugs get their name from the shape of their abdomen, as well as from the scent they release when distressed. Like most insects, shield bugs go through three main stages of metamorphosis: egg, nymph and adult. Adult female shield bugs lay their eggs in late April and early May. Each female lays approximately 20 to 30 clusters of eggs, adding up into the hundreds in total. These yellow to green, oval-shaped eggs are deposited onto the underside of leaves and stems of plants. They measure a little more than one tenth of a centimeter in length and width. When ready to hatch in late May, the eggs turn pinkish gray. Shield bugs undergo a simple metamorphosis, where the newly hatched juveniles, or nymphs, resemble the adult insects in their shape and vary mainly in size. As the nymphs grow from late May to August, they change color to include spots or markings, depending on the species of shield bug. 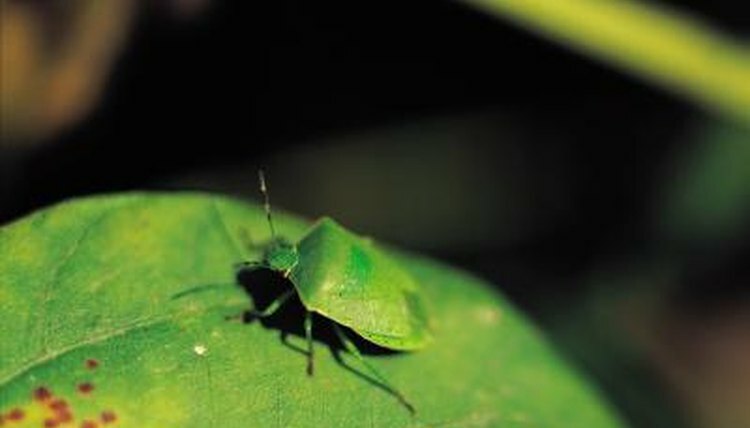 While in the nymph stage, shield bugs are flightless and spend most of their time feeding on vegetables and fruits. As nymphs, shield bugs undergo five molting periods as they grow. While molting over the summer, shield bugs outgrow their exoskeletons and must shed to accommodate their increased body size. During this time, the nymphs also grow wings and become sexually mature. Nymphs continue to eat gardens, crops and fruit trees as they molt. As adults in early fall, shield bugs are fully grown and have completed their life cycle. In late October as food sources begin to deplete, they begin to look for a warm place to hibernate over the winter. Shield bugs hibernate from late October until late April, when they re-appear to mate and the life cycle begins again. Adults typically reproduce only once per year in colder climates, while in warmer climates shield bugs may be able to reproduce more than once. What Kind of Beetle Does a Grub Worm Turn Into?